Organology (the study of instruments) was aided greatly by the development of book printing. 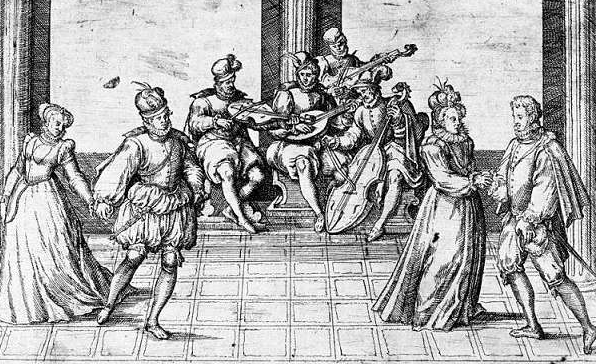 Michael Praetorius' encyclopedic Syntagma Musicum has a section with woodcuts which shows instruments as they were used on the continent about 17 years after the end of the Elizabethan period, and even 20 years hadn't made great changes. For the modern person, renaissance instruments appear odd. Most instruments came in 'families,' with sizes of the same instrument associated with the ranges of the human voice: descant (soprano), treble (alto), tenor, bass. (In some cases, these were extended up (sopranino, garklein) and in others, down (quart bass, contrabass, etc.) This arrangement had been in use for centuries. Playing instruments from the same family together was referred to as playing in consort. During Elizabeth's reign, the first documented regular use of mixed ensembles (broken consort) are recorded. Consorts were considered loud or soft, and the exact application of these titles is sometimes hard to pin down. Generally, loud consorts consisted of cornetti, sackbuts, shawms and the higher-pitched recorders and flutes. Soft consorts generally included the viols, flutes, recorders, krummhorns and other of the quieter instruments. Instruments of the 16th century could be broken down into four main types: string, wind, percussion, and keyboard. The lute was the most popular stringed instrument. The lute is identifiable by its size and shape, with the pear-shaped body and angled head. Strings are grouped in courses, each course consisting of a single or doubled string, tuned in unison or octaves. The most common lute of Elizabeth's time had 6, 7 or 8 courses, and was used both for solo and accompaniment purposes. Although the lute came in sizes, the Tenor was most popular. Similar instruments include the cittern, orpharion and bandora. The next most popular stringed instrument, made in sizes and played in consorts or alone, was the viola da gamba. The viol had six strings, and frets of gut tied around the neck, rather than embedded in the fingerboard. The shape of the body was somewhat like the violin family instruments, but with deeper ribs, a shallow top plate and a flat back in two parts with the upper part angled to give clearance to the player. There were three main sizes: treble, tenor, bass, with reference made in a Gibbons 6-part fantasia to the "great double bass." Unlike the violin family instruments, the viol bow was held underhanded, with the palm up and the middle finger in contact with the bow hair. The most popular size of the viol was the bass. Although roughly the size of a small 'cello, the bass viol had no end-pin, and, like the other viols, was supported by the legs (hence the Italian name, Viola da Gamba.) They were most commonly played in consort, i. e. as a family in groups of 3, 4, 5, and 6. In this way, they could be used as accompaniment for singing. Duet music for any two of the family still exists, and the bass, alone, was a popular solo instrument for pieces such as Woodycock. A small bass (or tenor-sized viol tuned as a bass) was often employed to play polyphonic music, Lyra-Way. When used in this fashion, the instrument was called lyra viol. Four sackbuts: bass, alto, tenor, bassThe common wind instruments included the shawms, recorders, cornetts, sackbuts (trombones), krumhorns and flutes (which were known as 'piffari'.) The trumpets and piffari were used for the announcement of the arrival of royalty and during military exercises. The shawms, cornetti and sackbuts were used in loud consorts. The flute had a sweet and solemn tone, the recorder had a more rich sound, but because of the windway (which directed the breath against the edge where the sound is created) the player had less dynamic control. The shawms and krummhorns were double-reed instruments, but because the krummhorns had a cylindrical bore, they sounded an octave lower than the shawms of the same sounding-length and were quieter. (This cylindrical bore is what gives the clarinet its characteristic sound, but the clarinet, as such, had yet to be invented.) The soprano of the shawm family (called 'hautbois' by the French, for high or loud wood) would eventually be tamed to make the baroque oboe. The bass of the shawms was so long that the player had to stand on a box to reach the reed, and wood cuts exist which show a bass shawm player holding the instrument horizontally, with another person helping to support. For this reason, the Curtal, with a folded bore, was often used to replace the bass shawm. The fife was a wooden pipe with six finger holes used with the drum in marching formations. Single reeds were used for the drones of bagpipes, but chanters used double reeds. Percussion was normally just various forms and sizes of drums and bells. The keyboards were the organs, virginals, and harpsichord. Other Elizabethan instruments included the organ portative, which was a type of small organ played with one hand while the player operated a bellows on the back of the instrument with the other. There was also the grand church organs and harps of various sizes.